You are currently browsing the Carpe DMM blog archives for September, 2015. We have woken up to a fine and sunny morning in Hahndorf, but very cold. We walked out to Cafe Assiette for breakfast. They had muesli on the menu, served with fresh banana, yogurt, and local honey. M. asked if she could have something substituted for her banana, and they said would strawberries be okay. M. said yes, and the other serving (mine) would be fine with banana. Then the lady said they didn’t have banana this morning! The fruit choices were strawberry or fig. M. asked for strawberry on both, but when they came they both had both strawberries and figs. Which was good, because I preferred the figs, and we did a swap. 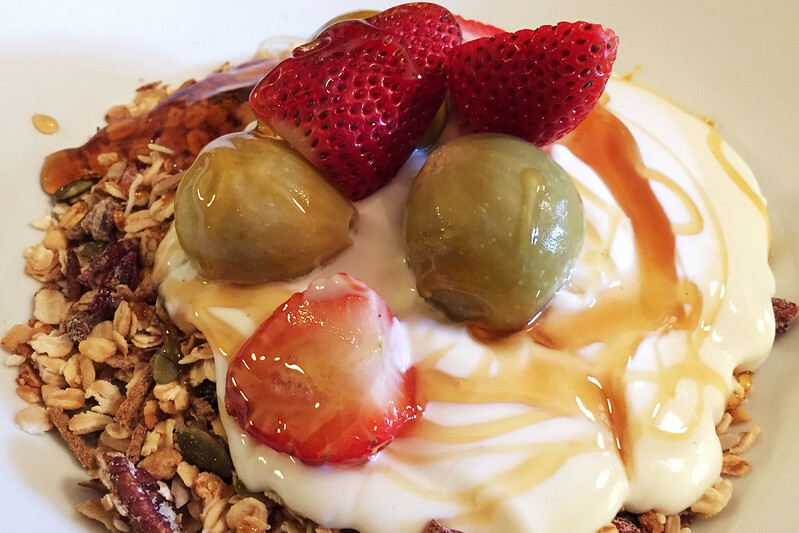 The muesli was really good, and the honey was a bit spicy which went well with it when mixed in with the yoghurt. On the way back we popped into a chemist to buy some sunglasses for me, after I lost my pair somewhere yesterday. I got a cheap pair, which M. says looks almost the same as my other pair. Read more: We check out the jam factory at a berry farm, the home of one of Australia’s most famous landscape painters, and travel to the McLaren Vale wine region for more good food and wine. We are in Hahndorf after a day on the road from Nuriootpa. We got up and went out for breakfast, driving the 2 km from our motel into Angaston. We went to the Soul with Zest cafe and both got the muesli, which was untoasted and unsweetened, and came with a small bowl of chopped fresh fruit on the side and milk. M. swapped her banana slices for my apple slices. I noticed the cafe had an interesting looking vanilla slice, with a cream layer and brown icing, and tried that, but was disappointed with the coffee flavour and overwhelming sweetness. Bottles of Grange Hermitage at Penfolds Winery. After breakfast we checked out of our motel and drove into Nuriootpa. Just out the other side we stopped at the Penfolds winery to taste some wines, getting there right after they opened at 10:00. It was a bit early in the morning for M. but I tasted some starting with a Pinot Gris, which was very nice. The red wines started quite heavy with a Shiraz Cabernet blend, and only got richer and weightier from there. 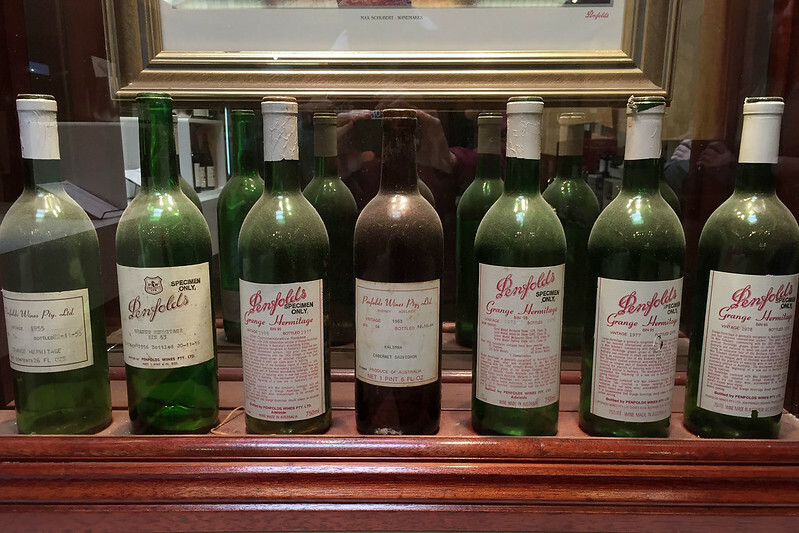 They had several bottles of the famous Penfolds Grange there, for sale from around $800 a bottle and upwards. They did offer tastings of Grange, but unlike the complimentary tastings of other wines, they charged $50 for a tasting amount of Grange, not even a full glass. They had a range of other Shiraz and Shiraz blends to try, and I tried several of them, before settling on a selection for a case of six bottles to be shipped home for us. Read more: We leave the Barossa Valley, travel through scenic countryside hills, and find a Bavarian village!